II. What Information Does AACVB Collect? In order to serve you better, it is necessary for AACVB to collect certain information. The type of information that AACVB collects depends on what you do when you visit our website. A. Information That You Provide to Us In order to send you a FREE visitors guide or our the FREE e-news that you can request from our site, you will need to provide us with some personal information about yourself. Examples of the information that we collect includes: (1) your name; (2) your postal address; (4) your e-mail address; (5) how you heard about our website; etc. B. Information That We Collect Automatically We also collect certain types of information automatically whenever you access and use our website. Examples of the information we collect automatically include: (1) the browser software you are using; (2) the date and time you access our website; (3) the Internet address of the website from which you linked directly to our website; etc. C. Collection of Personal Information from Children AACVB believes that it is extremely important to protect children's personal information. As such, AACVB does not collect any personal information that can be identified with anyone under the age of 16. In fact, as discussed in our Terms and Conditions, no one under the age of 16 is allowed to use any features of this website that result in our actively collecting personal information, such as requesting a FREE visitors guide. III. What Does AACVB Do with the Information It Collects? The primary reason why we collect information from you is to provide you with the services that you request and to enhance your experience at our website. 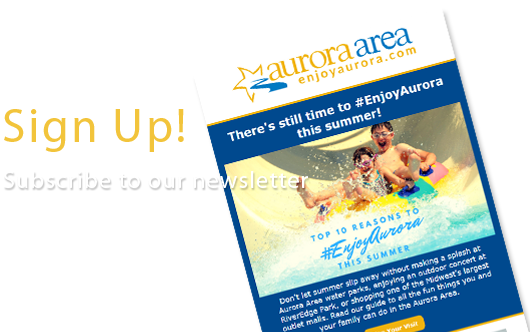 Services such as the free mailing of the Aurora Area Visitors Guide would be impossible without the personal information that you provide to us. We also use the information we collect to make sure that our website provides you with the resources you need and the level of quality you expect. For example, information about the sections of the website that people visit most frequently and least frequently helps us to decides which features website users find useful and which features need some changes. In addition to our internal use of the information we collect, your personal information is used to help make sure that you receive all the information you need to make your stay in the Aurora area as pleasant as possible. One way we do this is by using your e-mail address to send you periodic updates about the Aurora area. We do NOT share your information with outside vendors and mailing organizations. If you have subscribed to our regular e-news emails and prefer that AACVB not email you anymore, you can unsubscribe on our website, or by calling us at 630-256-3192. IV. What Kind of Security Does AACVB Use to Protect Your Privacy? First, we do not willingly share your information with any third parties. Second, we know that when you provide us with any type of information, you're trusting us to keep it safe from unauthorized intrusion. We take reasonable steps, through the use of updated security software and protocols, to ensure that your personal information is safe. You have several options when deciding how you can best protect your personal information. One option is simply not to volunteer any personal information. This approach would prevent you from receiving a free visitors guide or free e-news emails. Another option is to configure your Web browser to refuse all new cookies, to notify you whenever you are about to receive a new cookie, or to disable cookies completely. The Federal Trade Commission's website also offers useful information about how to protect your personal information while on the Internet. We know that you want the information we have on record about you to be as complete and accurate as possible. We feel the same way, since maintaining accurate information is essential to our efforts to give you the best possible experience when you visit our website. That's why we encourage you to correct any information that might be outdated or otherwise invalid. It's easy to make changes. Simply use our website or contact us by telephone at 630-256-3192. Any use herein of the terms "AACVB's website" or just "website" refers to all publicly accessible webpages that are identified with and under the control of AACVB. Terms "AACVB," "us," "our," "we," and any variation thereof refer to the Aurora Area Convention and Visitors Bureau and may include independent contractors who operate portions of the AACVB website on AACVB's behalf. Unless otherwise noted, this website and all of the materials contained herein, including the photos, HTML code, source code, and any other code used to generate any portion of this website, are the copyrighted property of AACVB or of third parties who have licensed AACVB to use their property. None of the content or data found on this website may be reproduced, republished, distributed, sold, transferred, or modified without the express written permission of AACVB provided, however, that users may reproduce a single copy of any webpage for their personal use. In addition, the trademarks, logos, and service marks displayed on this website (collectively the "Trademarks") are registered and common law trademarks of AACVB and/or third party service providers. Nothing contained on this website should be construed as granting, by implication, estoppel, or otherwise, any license or right to use any of the Trademarks without the written permission of AACVB and/or the appropriate third party service providers. As a condition of your use of this website, you agree that you will not use this website for any purpose that is unlawful or prohibited by these Terms and Conditions of Use. Actions that you agree not to take include, but are not limited to: (1) taking or attempting to take any action that grants you access to the website to an extent greater than authorized by AACVB; (2) taking or attempting to take any action that results in an unauthorized modification, addition, or deletion to the website; (3) taking or attempting to take any action that violates the security of the website; (4) taking or attempting to take any action that would impose an unreasonable or excessively large load on the website's infrastructure; and (5) knowingly providing false or misleading information to AACVB. This website is strictly for your personal and non-commercial use. In the absence of AACVB's express prior written consent, you may not modify, copy, transmit, distribute, display, publish, or reproduce this website or any part thereof for any purpose other than your own personal and non-commercial use. AACVB believes that it is extremely important to protect children's personal information. As a result, no one under the age of 16 is allowed to use any features of this website that result in our actively collecting personal information, such as request for a free visitors guide or to sign up for our free e-news emails. By using any such features, you represent that you are age 16 or older. This website contains hypertext links to other websites that are maintained by and under the control of third parties (the "Linked Websites"). AACVB is not responsible for, and makes no representation or warranty regarding, the content or accuracy of any of the Linked Websites. The inclusion of a link does not mean that AACVB endorses, has reviewed, or approves of the Linked Website or the individuals and/or organizations responsible for the Linked Website. These hypertext links are provided as a convenience only, and AACVB is not responsible for any content that can be accessed through a hypertext link. If you access a Linked Website, you do so at your own risk. Any questions that you have about one of the Linked Websites should be directed to the individuals and/or organizations responsible for that website. The Internet is a distributed network of millions of computers. Although we attempt to verify all links on a regular basis, there is a possibility that the particular server that you are attempting to link to is not currently operational. Please e-mail us at webmaster@enjoyaurora.com to let us know about a broken hyperlink. Individuals may, for personal, non-commercial use only, bookmark or point to any page within AACVB's website. Other users/websites MAY: (1) include a link to AACVB's website by pointing to the website's home page at https://www.enjoyaurora.com; and (2) link to AACVB's major subcategory pages (e.g. Dining, Meetings & Conventions, Hotel Packages, etc. ), provided that it is made clear that the information is being provided by AACVB. Other users/websites MAY NOT without AACVB's express written consent: (1) point or link from a website directly to content within AACVB's website other than by pointing or linking to https://www.enjoyaurora.com or one of the major sub-category pages as provided above,; (2) copy, modify, or display AACVB's name, logo, text, or graphic images in any way; or (3) redeliver any of the pages/text/images/content of AACVB's website using "framing" technology. AACVB makes no representations about the suitability, reliability, availability, timeliness, lack of viruses or other harmful components, and accuracy of the information, products, services, related graphics, and all other content found on this website. All such information, products, services, related graphics, and all other content found on this website are provided "as is" without any kind of warranty. AACVB hereby disclaims all warranties and conditions with regard to such information, products, services, related graphics, and all other content found on this website, including all implied warranties and conditions of merchantability, fitness for a particular purpose, title, and non-infringement. In no event shall AACVB be liable for any direct, indirect, punitive, incidental, special, consequential, or any other type of damages arising out of or in any way related to the use or performance of AACVB's website, the provision of or failure to provide services, or for any information, products, services, related graphics, and other materials obtained through AACVB's website, or otherwise arising out of the use of AACVB's website, whether based on contract, tort, negligence, strict liability, or otherwise, even if AACVB has been advised of the possibility of such damages. Please note that because some states/jurisdictions do not allow the disclaimer of certain warranties and/or the exclusion or limitation of liability for certain types of damages, some of the preceding disclaimer, exclusion, and limitation may not apply to you. In such event, please see the section below entitled "Restriction on Use Based on Location." From time to time, it may be necessary for AACVB to amend these Terms and Conditions of Use. You are responsible for regularly reviewing these Terms and Conditions of Use so that you will be aware of any changes. Please note that your continued use of this website means that you accept the amendments to these Terms and Conditions of Use. This agreement and its performance are governed by the laws of the State of Illinois and the United States of America without regard to any conflicts of law provisions. You agree to submit to the exclusive jurisdiction of the state and federal courts located in the City of Aurora, County of Kane, State of Illinois, United States of America, for all disputes and issues regarding your use of this website and your compliance with these Terms and Conditions of Use. AACVB makes no claims regarding the legality of viewing or downloading the content of this website in any country other than the United States. Anyone who accesses this website in a country other than the United States does so at his or her own risk. If AACVB determines that you have violated any provision of these Terms and Conditions of Use, AACVB has the right, in its sole discretion, to pursue any and all of its legal remedies. You agree to defend, indemnify, and hold harmless AACVB, and its officers, directors, employees, and agents from and against any and all claims arising from your use of the website. These Terms and Conditions of Use and any other policies and/or guidelines referred to herein constitute the entire agreement between you and AACVB regarding this website, and supersede all other prior or concurrent oral or written letters, agreements, or understandings related to this website.